The material culture of the British-Egyptian encounter explores how the souvenirs, antiquities and curiosities collected by soldiers function as a means of self-fashioning and as repositories of memory and meaning. The sale of replica pieces as genuine antiquities has been big business in Egypt for hundreds of years. At the start of the First World War the trade in Egyptian fake antiquities was large and proved a decent source of income for street sellers in Egypt – and these objects would become the ‘bric a brac’ of war. For the amateur soldier-archaeologist there were many opportunities to secure Egyptian antiquities. A short ride with a local guide to a rich grave site would secure a few dozen such treasures after a few moments digging. 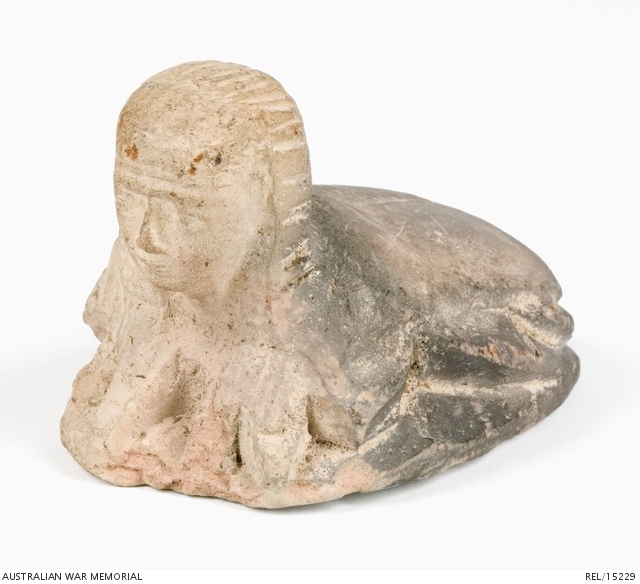 Curios could be purchased from street sellers, authentic antiquities dug up from certain sites or faux objects ‘inspired’ by authentic pieces, such as the large scarab sphinx paperweights held by the Australian War Memorial were purchased. Sphinx Scarabs were a popular subject for Giza souvenir salesman in 1915 , the scarabs are typically made of clay, artificially aged and glazed to resemble stone. Typically, the inscriptions feature the cartouches of either Ramesses II or Seti I, a common indicator of pieces specifically manufactured for the ‘tourist’ market of the time. 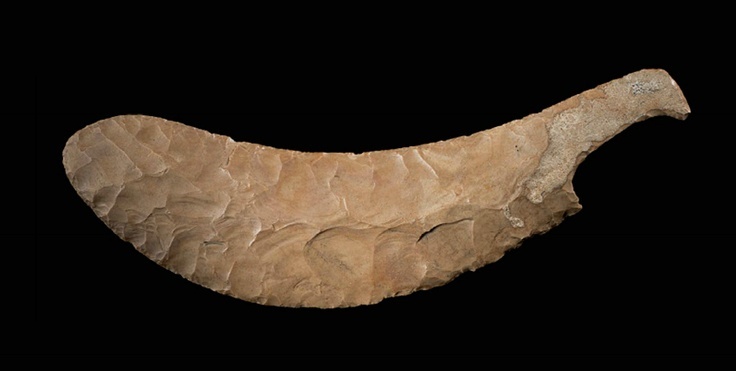 A flint bladed knife purchased by Major E.O Milne DSO in 1915 is one example of the many genuine pieces purchased in Egypt migrating into private collections. Typically, soldiers appear to have purchased small, portable pieces that were easily transportable or could be sent home if the opportunity presented itself. The Australian War memorial contains some beautiful examples of sweetheart brooches and other examples of ephemera commissioned in Cairo by members of the AIF during the First World War. 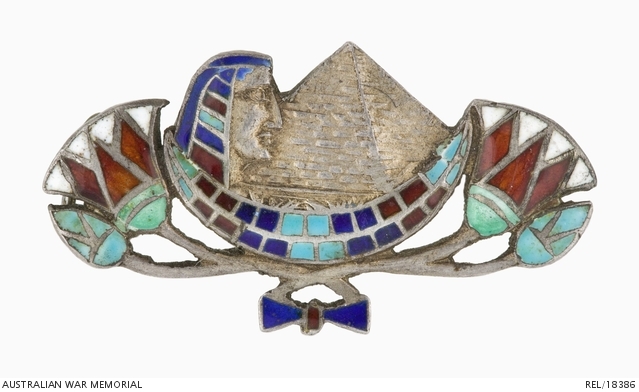 This Egyptian souvenir brooch held by the Australian War Memorial is associated with the Millington family of Axedale, Victoria. This brooch was purchased and sent home during the First World War by either Henry Lees Millington, who served with 4 Light Horse Regiment, AIF, and was killed at Gallipoli, or his brother Frank Gould Millington, who served with the 7 Battalion, AIF. Soldiers have always made decorative art or souvenirs during their spare time. Trench art pieces can be war souvenirs collected by soldiers or non-combatants during a war and demobilisation, and modified to serve as remembrance. They can be souvenirs crafted by soldiers during a war, souvenirs made for sale to soldiers by other soldiers or civilians, or souvenirs made by POWs in exchange for food, cigarettes or money. Some are mementos of the war made by convalescent soldiers. The final group are post-war souvenirs made for tourists visiting the battlefields and post war souvenirs made by commercial firms in ‘trench art’ style. 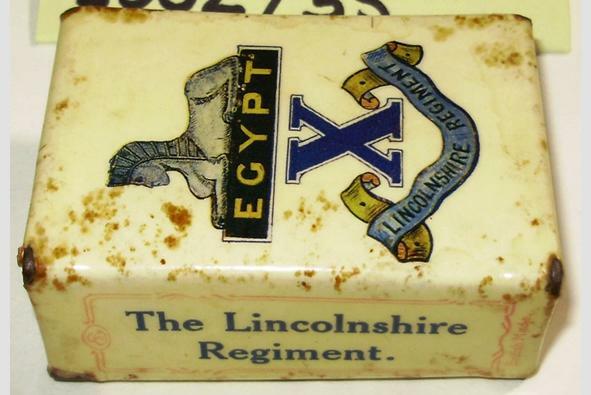 Many pieces are notable in that they explore the curious blending of the local and the ‘exotic’ that resulted from the incorporation of Egyptian symbols such as the Sphinx into British regimental iconographies and traditions. The majority of Trench Art pieces in the Royal Lincolnshire Regimental Collection are from World War One and this beautiful example of a Matchbox holder designed to resemble a book with the regimental cap badge on the face. Objects such as these provide a fascinating opportunity for further study and I look forward to sharing further examples with you as part of my ongoing research into soldiering in Egypt.